There are periods of fashion I am naturally attracted too like the 1920s and 1870s, but others that I am learning to apperciate more. One of these is 1910s clothing. 1910s clothing can be broken down into two major eras. The early part of the decade has a column silhouette, like this dress from 1912. After the beginning of World War I in 1914, the skirts begin to flare out and shorten. The silhouette becomes much freer. 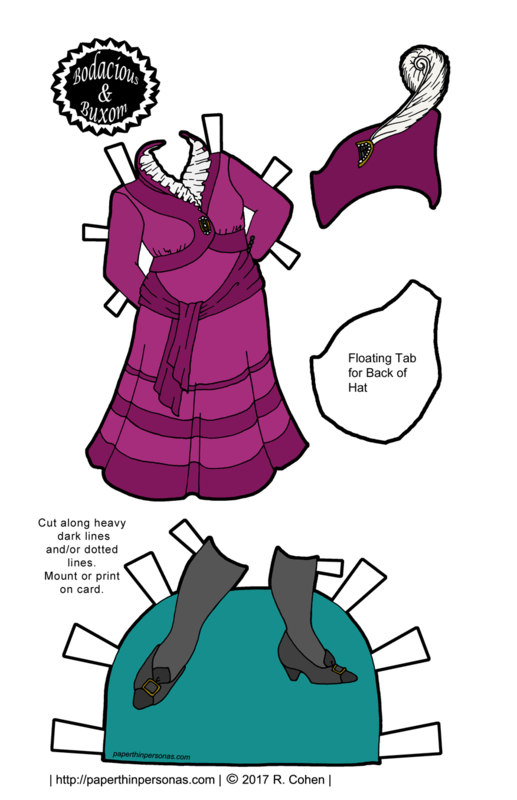 Today’s paper doll outfit is from 1915 and falls into this flared skirt era. Other examples of this “look” include this fashion plate from 1916, this dress or this suit. One thing I love about 1910s clothing is the profusion of really absurd looking hats, like today’s hat from this fashion plate. I mean, really? I would say that surely no one wore a hat like that, but check out this example and this example from the Met. See? Absurd hats abound in the 1910s. Does anyone but me kinda wish we still wore hats? Let me know in a comment. Clearly, I need to spend more time in this era. There’s some fun stuff there. One quick historical note: No one wore socks like the ones I drew here in 1910, but I didn’t want do deal will bare legs (which would have been a scandal in 1910) and I didn’t want to have draw full on stockings or attach the shoes to the dress, so this was my solution. Not perfect from a historical accuracy point of view, but there you have it. Think about becoming a patron or following the facebook page if you want to show the blog some love. Did you know my Reader2017 coupon is still good for the Etsy store? 25% off if you want to pick up some paper dolls. 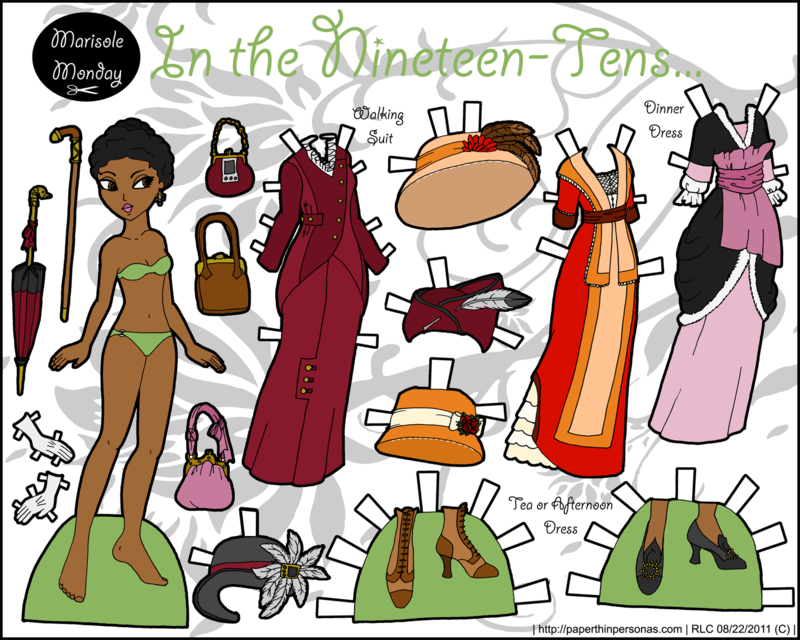 I’ve been busily converting old color Marisole Monday paper dolls into black and white files. Sometimes, this is a totally painless process, but the older the files get and the more… cranky the line-work becomes. Still, it’s been rather fun and it is probably the only time I will ever do this. First, let’s take a short trip to the 18th century, shall we? Fourth of July paper doll from several years ago. She had a friend, but I haven’t converted that one to black and white yet. Though personally, I’ve never been that keen on the fashions of the 1910’s, I really love how this paper doll came out in color and I think she’s just as cute in black and white. She was inspired, though I don’t think I mentioned this in the original post in part by this doll from Madame Alexander of CJ Walker. 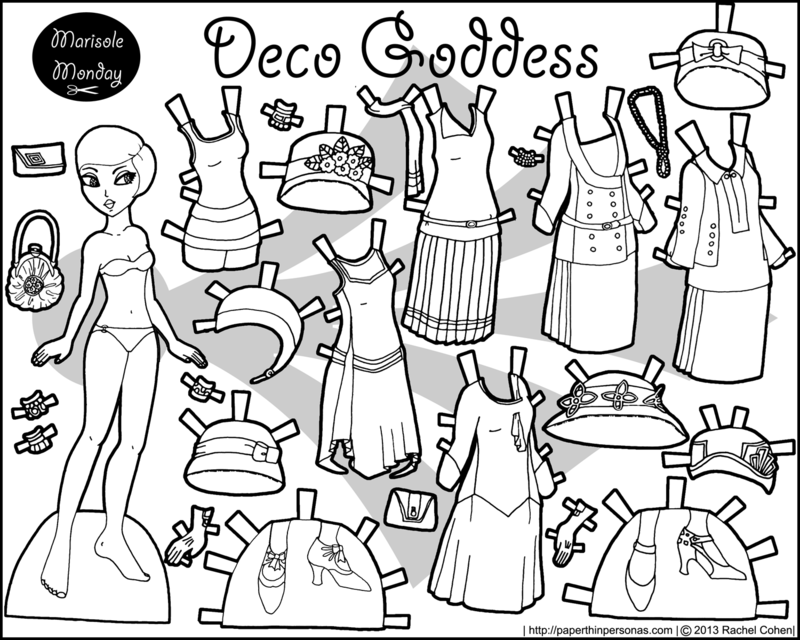 I do love the 1920s, as you can see from the color version of this paper doll, but I do think that Marisole makes an odd flapper girl. 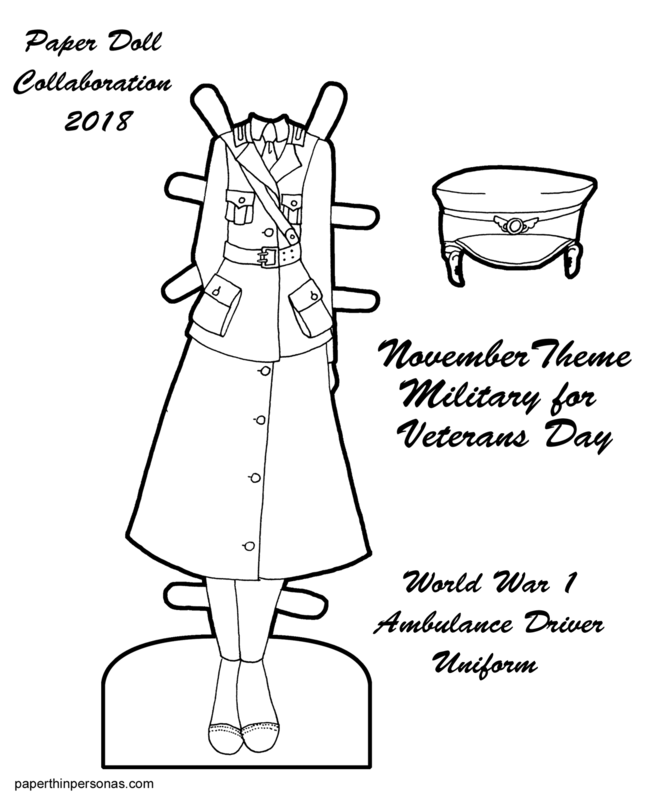 I had so much fun drawing and researching this paper doll. I’d forgotten what a blast it is to settle down in the library with a big stack of historical costume books. (Okay, so maybe that makes me all kinds of geeky, but I can be cool with that.) The early teens of the 20th century are fascinating to me, because they are before the Great War (also known as World War 1) and repersent the last hurrah of a culture that was ended by the time was war ended. The Great War truly changed the cultural and poltical and geographic landscape of Europe and when it was over, nothing would ever be the same. While historical interesting, the Second World War’s cultural upheavel can not be compared to the devestation wrought by the First World War. Along with historical costume and libraries, I am a bit of a World War One buff. Anyway, I mostly used The Cut of Women’s Clothes: 1600-1930 by Waugh, Fashion in Costume 1200-2000 and Fashion Accessories: The Complete 20th Century Sourcebook. None of them are what I would call excellent texts (except The Cut of Women’s Clothes: 1600-1930), but they all served the purpose of providing images of clothing to draw from. I have my doubts about Peacock’s research sometimes since his work is not extensively footnoted, but I love how easy it is to draw from. I should add that all of Marisole’s costumes come from between 1910 and 1915- the first part of the decade up to the first year of the Great War. 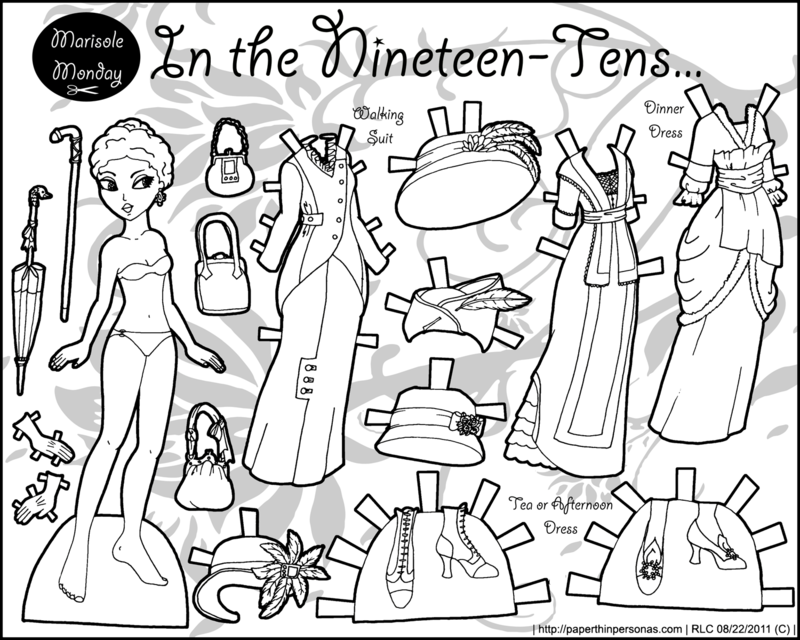 Edit 8/23/13: This paper doll is now available in black and white for coloring.